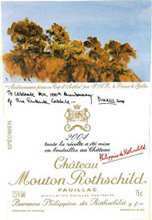 The 2004 Mouton-Rothschild was the first vintage for Philippe Dhalluin, who was so successful in persuading the late Philippine de Rothschild to institute a more strict selection with respect to Mouton-Rothschild. The outstanding 2004 exhibits delicious notes of cedarwood, Christmas fruitcake, blackcurrants and toast. The wine possesses outstanding concentration, medium to full body, excellent purity, hints of forest floor and underbrush, and sweet, velvety tannin. It is on a fast evolutionary track, so consume this over the next 10-15 years. Tasted at Bordeaux Index annual 10-year on tasting from an ex-château bottle. The Château Mouton-Rothschild 2004 has a refined, much more understated bouquet compared to say, Château Margaux. It is taciturn at first but with encouragement it reveals vibrant black cherries, tobacco, sage and graphite. The palate is medium-bodied with supple tannins on the entry. There is fine freshness to this Mouton, though it does not have the depth or ambition of a top vintage. But it has a sense of classicism that runs from start to finish, with subtle notes of espresso infusing the finish. Fine. Tasted March 2014.